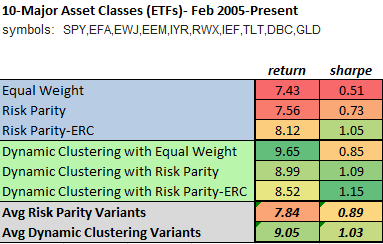 Here is a backtest that was done using a dynamic clustering method introduced by Michael Kapler at Systematic Investor combined with multiple allocation schemes: 1) equal weight within and across clusters 2) risk parity within and across clusters and 3) cluster risk parity (CRP): equal risk contribution (ERC) is used within and across clusters. For comparison purposes, we show equal weight allocation, risk parity, and risk parity ERC without clustering. For testing we used 10 major asset class ETFs. The performance of the average of dynamic clustering versions versus the average of their non-clustered counterparts is slightly superior on both a return and risk-adjusted basis. All individual clustering methods also outperform their non-clustered counterparts. More significantly, Cluster Risk Parity (CRP)–or Dynamic Clustering with Risk Parity-ERC– was the best performer and outperforms all other allocation methods in terms of risk adjusted return, and has the second-best annualized return. This is only one universe, and the differences are not substantial–but do conform to what we would expect theoretically. There are a lot of moving parts- both the clustering approach, and the inputs (variance/covariance information and returns) can be used to improve performance and reduce turnover. But the most basic methods tend to demonstrate the validity of this sound theoretical approach. In the next post we will look at static versus dynamic clustering on a different universe. This is actually a side comment re: equities markets selection for this test. I see SPY, EFA and EEM. Among them you have the whole equities world. Why did you need to include EWJ? Isn’t it redundant, as it already part of EFA? hi stefan, you are correct. technically speaking one should use IEV vs EFA, the choice was just based on liquidity and data history (EFA has more data and greater liquidity and smaller spreads). in practice the difference isn’t significant. For each strategy what are the total number of trades, average gain per trade, and slippage/commission used to acheive the posted results. hi Carl, I didn’t include a breakdown because this was a concept test. When we release the paper, we will show a breakdown of the turnover—but the specifics you are mentioning are more appropriate for a trading system paper–this is a low turnover/high gain per trade strategy anyway as are the traditional risk parity variants.